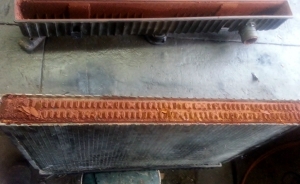 Do you want you radiator to look like this? Most of us would just drain the coolant/antifreeze out of the radiator and then refill the system with the appropriate mix of antifreeze/water. At Muirs Radiators, we do a lot of coolant/antifreeze changes in vehicles. So we decided to upgrade our cooling system flushing machine. When you bring your vehicle into Muirs Radiators for a coolant change, you can have piece of mind that it is going to be done effectively and efficiently. With this new flushing machine, we can drain your old coolant, run some cooling system flushing chemical around your system - to get rid of any residue, refill your system with Muirs Antifreeze and get your vehicle to running temperature to check the whole system effectively. 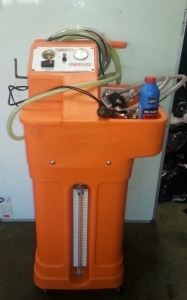 If your cooling system is extremely dirty then after we have chemically flushed your system, we can also put into your system along with your Muirs antifreeze, a product called Philm Off - the no flush radiator rust and sludge eliminator. This product stays in your cooling system, mixing around with your Muirs antifreeze and dissolves any left over residue, rust or other contaminants from your radiator and cooling system while you drive.